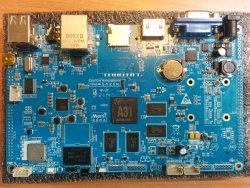 The board reads "Quad-Core HummingBird Kit"
The board comes with Android 4.2.2 (3.3.0 kernel) preloaded in the NAND. The Hummingbird A31 is only partially supported. No support in the community maintained sunxi-3.4 kernel is planned. Please skip to the next Mainline U-Boot/Mainline kernel sections. Supported in the mainline u-boot git 'master' branch and scheduled for the v2015.04 release. For building mainline u-boot, use the Hummingbird_A31 target. Mainline kernel support is included in 3.17. Currently only UARTs, USB, I2C, and GMAC are supported. HDMI/VGA display is support with the latest mainline u-boot using simplefb. Use the sun6i-a31-hummingbird.dtb device-tree file for the mainline kernel. The UBOOT button triggers FEL mode. See BROM for more information on the boot sequence. 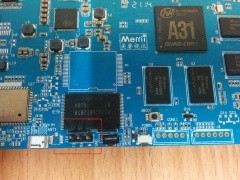 The Hummingbird A31 uses an external DAC (GM7123), numbered U6 on the board, to convert output from LCD0 (TCON0) to RGB. No configuration is required, other than enabling power to the chip, using GPIO PH25. Note: DDC is not supported. The Hummingbird A31 uses a low power TV decoder chip for TV in. The chip's output is connected to CSI on the PE pin group. It is controlled via I2C on TWI0. Power is controlled with GPIO PH26. The Hummingbird A31 exposes 2 2.54 mm pitch connectors with lots of expansion possibilities. The UART header is right next to the NAND chip and IR receiver. Just attach some leads according to our UART howto. This page was last modified on 23 January 2016, at 00:31.